Did you know that trampoline gymnastics is more than just a sport? It’s an Olympic sport! But even those of us who aren’t destined to win a gold medal can reap the benefits of trampoline gymnastics. People of all ages are using trampolines to learn and perfect everything from simple gymnastics moves like front tucks and flips, to more complex moves like quadruple flips, aerials and more. 1. World’s best trampoline tricks – amazing moves including the quadruple flip, mid air running & 360 spin. 3. These boys are showing off awesome tricks on their backyard trampoline, including a landed cork and more! 4. Amazing trampoline gymnastics & a bit of parkour for good measure! 5. This guy has the best job ever; he works at an indoor trampoline park! No wonder his skills are so awesome. 6. Totally amazing gymnastics on a trampoline, including triples and aerials. 7. This girl shows how easy it is to learn the basics, and how much fun it is to do gymnastics on a trampoline. 9. You will want your own trampoline park after you see how much fun these people are having doing awesome tricks on huge trampoline set. 10. This guy is having a blast and showing how anyone can use a trampoline to bounce, flip, roll and tuck. 11. The girl in this video is showing off simple moves and some more fancy ones like straddles, front flips and tucks. Trampoline gymnastics are getting more popular all over the world. If you have a trampoline already and have been thinking about learning gymnastic moves, I think these videos offer some great tips. And of course, remember to follow safety rules and be sure you have someone who knows what they’re doing close by to give you guidance and support. And if you still need a trampoline, you’ve come to the right place because ours are the world’s safest! 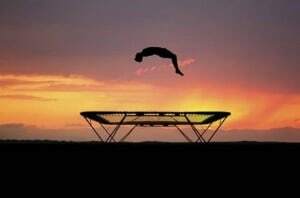 Browse around to learn more about trampolines and how you can use them to improve your fitness. Then check out our selection to find the one that’s perfect for you and your family.